Ali ibn Abi (or Abu) Talib (Arabic: علي بن أبي طالب) (ca. 21 March 598 – 661) was an early Islamic leader. He is seen by the Sunni Muslims as the fourth and last of the Khulafā-i-Rāshidūn (rightly guided caliphs). Shi'a Muslims see him as the first imam and the first rightful caliph. He was also Muhammad's cousin, and, after marrying Fatima, his son-in-law as well. Thus, he is a revered figure for all Muslims, although there is dispute regarding whether he is next, or fourth, from Muhammad in merit. All Muslims respect his piety, however, and he is an important figure within the mystical (Sufi) branch of Islam where he is often cited as a link in the initiatic chain (silsilah) that each Sufi masters traces back to Muhammad. He is especially remembered for his strong conviction that inner piety must be expressed externally in just acts and in compassion for the disadvantaged. Thus, although often cited as the cause of contention between Sunni and Shi'a Muslims, Ali is also a figure around whom Muslims unite, a reconciling figure given impetus by recent moves towards the mutual recognition of different legal schools in Islam. Many Sunni regard Shi’a as fifth school alongside the four Sunni schools. On the other hand, rivalry between Sunnis and Shi'a Muslims has been damaging to the unity of Islam and to Muslims' ability to practice the ideals of their Prophet, which called for the care of all and respect for all within the ummah. Ali was born at Mecca, in the Hejaz region of northern Arabia, sometime around 599 C.E. (the year is an approximation only). Ali's mother, Fatima bint Asad, also belonged to Banu Hashim, making Ali a descendant of Ishmael, the son of Ibrahim (Abraham). Shi'a Muslims believe that he was born inside the Ka'bah, the Muslim holy place. Ali's father, Abu Talib, was a member of the powerful tribe of the Quraysh (which held the custodianship of the Ka'bah), and an uncle to the young Muhammad. When Muhammad was orphaned and then lost his grandfather, Abu Talib took Muhammad into his house. Ali and Muhammad were thus cousins raised as brothers, with Ali in the role of a younger brother, looking up to Muhammad and ready to follow his lead. Ali stood firm in support of Muhammad during the years of persecution of Muslims in Mecca. In 622 C.E., the year of Muhammad's Hijra (migration) to Yathrib (renamed Medina-al-nabi, or “city of the prophet”), according to Islamic sources, Ali risked his life by sleeping in Muhammad's bed to impersonate him and thwart an assassination plot, so that his cousin could flee in safety. Ali survived the plot, but risked his life again by staying in Mecca to carry out Muhammad's instructions: to restore to their owners all the goods and properties that had been entrusted to Muhammad for safekeeping. The small community of Muslim immigrants in Medina, the Muhajirun, were at first extremely poor. They had no land, no houses, and lived on the charity of the Medinans who had converted to Islam (the Ansar) or 'helpers'. They hired themselves out for labor and as the Muslims community grew stronger engaged in military action against their Meccan opponents. Ali shared in all the labor and hardships of the community. Ali first distinguished himself as a warrior in 624 C.E., at the Battle of Badr, the first armed conflict in which Muslims were involved. He defeated the Banu Umayyed champion Walid ibn Utba as well as many other Meccan soldiers, and Muhammad publicly praised him. After this, he was emboldened to ask for the hand of Fatima Zahra, Muhammad's daughter by Khadija, in marriage. Fatima and Muhammad consented, and the marriage was solemnized two months after the battle. Ali was also prominent on the Battle of Uhud. He is said to have received 17 wounds in the battle. "Will you not be pleased that you will be to me like Aaron to Moses? But there will be no prophet after me." For the ten years that Muhammad led the community in Medina, Ali was extremely active in his cousin's service, serving in his armies, leading parties of warriors on raids, carrying messages and orders. With the exception of Battle of Tabouk, Ali joined all of Muhammad's battles and expeditions. As Muhammad's son-in-law and one of his lieutenants, Ali was a person of authority and standing in the Muslim community. Muhammad had been ailing for some time, but seemed to recover somewhat. He left his house to take part in prayers at the mosque, then returned to his quarters and died. Ali had a strong claim to the leadership, both as one of Muhammad's closest assistants and as his cousin and son-in-law, but he was passed over for the leadership. He was absent when Abu Bakr was selected to become the first Caliph. At first he declined to swear fealty to Abu Bakr, and was followed by a significant portion of Medina's Muslim community. They were known as the Rafidi, or “Refusers,” and later as the Shi'at Ali, the party of Ali. This is an extremely controversial issue. Muslims ultimately split into two schools, based on their attitudes towards the issue of succession to the post-Muhammad leadership of the community. The Shi'a (about 15 percent of Muslims in the world today) believe that Muhammad, in accordance with God's command, designated Ali to succeed him, and that Ali was a victim of worldly intrigue; the Sunni believe that the community made a wise choice in uniting behind Abu Bakr. Sunni and Shi'a also disagree on Ali's attitudes towards Abu Bakr, and the two caliphs who succeeded him, Umar ibn al-Khattab and Uthman. Sunnis tend to stress Ali's acceptance and support of their rule, while Shi'a claim that he distanced himself from them, while continuing to serve in the forefront of the Muslim armies. While Abu Bakr nominated Umar, who was then popularly acclaimed, Umar appointed a committee of six to nominate his successor from among themselves. Ali was one of the six. According to some sources, when he was asked whether, as Caliph, he would rule according to the Qur'an and the Sunnah (tradition of the Prophet) and abide by the decisions of the first two caliphs, Ali replied yes to the first but no to the second. He appears to have thought the committee presumptuous: “What had I to do with this ‘consultation?’” Uthman was appointed. Ali and Fatima, as well as Muhammad's widows, had an additional cause for disaffection with Abu Bakr. Muhammad had acquired various lands and properties in the last years of his life. Those he left behind expected that this property would come to them, according to the inheritance laws proclaimed by Muhammad himself. However, Abu Bakr claimed that he had heard Muhammad say that prophets do not leave an inheritance. Abu Bakr argued that the property had been held by the Prophet in trust for the community, and was rightfully the property of the state—despite Ali's rejoinder that Muhammad's revelations included accounts of prophetic inheritance (Qur'an 27:16, 21:89). Abu Bakr gave state pensions to Muhammad's widows, but Muhammad's blood relatives, Ali, Fatimah and Ibn Abbas, did not receive even that much. Ali wrote that he “watched the plunder of his inheritance.” Muir points out, though, that Ali took part in counsel and acted as Chief Judge under Abu Bakr and he contributed to the codification of Islamic law. After Fatima's death, Ali again claimed her inheritance, but was denied with the same argument. The caliphs who followed Abu Bakr, Umar and Uthman, also refused to return the various properties, whether to Ali or to Muhammad's widows. Shi'a Muslims regard this as yet another instance of the persecution of Muhammad's lineage, the Ahl al-Bayt, at the hands of the caliphs they regard as usurpers. In 656 C.E., the third caliph Uthman, was murdered in his own house, in Medina, by rebellious Muslim soldiers. 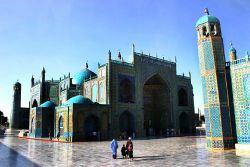 Medina, now a large city and the capital of an empire stretching from Africa to Central Asia, fell into chaos. In a crisis, a faction of the citizenry turned to Ali, who had been for years a faithful and steady lieutenant of Muhammad and his successors, and urged him to seek the caliphate. Ali at first refused. He was horrified by the assassination of Uthman, and did not wish to appear to be profiting from the situation. His supporters, in particular two former members of the council of six, Talha and al-Zubayr, persevered, arguing that only he had the authority to prevent the Caliphate from disintegrating and Ali finally allowed himself to be proclaimed caliph. Soon thereafter, Ali dismissed several provincial governors, some of who were relatives of Uthman, and replaced them with companions of the Prophet (such as Salman the Persian) or trusted aides (such as Malik ibn Ashter). Ali then transferred his capital from Medina to Kufa, the Muslim garrison city founded by Umar in what is now Iraq. The capital of the province of Syria, Damascus, was held by Mu'awiyah, the governor of Syria and a kinsman of Ali's slain predecessor. Mu'awiyah raised an army and marched against Ali, also demanding vengeance for the death of Uthman. A prolonged battle took place in July 657 C.E. in the plain of Siffin (or Suffein), near the Euphrates River. The battle seemed to be turning in favor of Ali when a number of the opposing army, fixing copies of the Qur'an to the points of their spears, exclaimed that "the matter ought to be settled by reference to this book, which forbids Muslims to shed each other's blood." At this point, the soldiers of Ali refused to fight any longer, and demanded that the issue be referred to arbitration. Abu Musa Asha'ri was appointed advocate for Ali, and `Amr-ibn-al-As, a veteran diplomat, was for Mu'awiyah. It is claimed that `Amr persuaded Abu Musa that it would be to the advantage of Islam that neither candidate should reign, and asked him to give his decision first. Abu Musa having proclaimed that he deposed both Ali and Mu'awiyah, `Amr declared that he also deposed Ali, but invested Mu'awiyah with the caliphate. This decision greatly injured the cause of Ali, which was still further weakened by the loss of Egypt to Mu'awiya's forces. Mu'awiyah became the first Umayyad, later claiming that he was more entitled to be Caliph than Ali's son, Hasan, since he had a “better understanding of politics and was also much older” than the Prophet's grandson. Effectively, this ended Ali's caliphate. According to tradition, three Muslim zealots (purists later termed Kharijites) had agreed to assassinate Ali, Mu'awiyah and `Amr, as the authors of disastrous feuds among the faithful. The assassins sent against Mu'awiyan and `Amr failed; the only assassin who succeeded was the one who attacked Ali. The Kharijites departed from Ali's company at the Battle of Siffin, believing that 'God alone should judge' and that he had been wrong to defer to human arbitration. Ali was stabbed on the head by a poisoned sword while he was performing morning prayers. Before he died, he is said to have ordered that his assassin, Abdur Rahman bin Muljam al Sarimi, be killed quickly and humanely, rather than tortured. Ali died in Kufa in 661 C.E. A splendid mosque called Mashad Ali was afterwards erected near the city at Najaf, the place of his burial (although some believe he is buried at Mazar-e-Sharif in Afghanistan). Ali had eight wives after Fatima's death, but while she was alive he was monogamous. It is said that Ali had a total of 33 children; one of whom, Hasan bin Ali, a son of Fatima, is said to have refrained from publicly claiming the caliphate so as to prevent further bloodshed among Muslims. Mu'awiyah I thus became caliph and established the Umayyad dynasty of caliphs. Hasan is, however, revered by most Shi'a as the second imam; his brother Husayn bin Ali is reckoned as the third, except by the Shi'a Ismaili, who consider him the second imam. Ali's descendants by Fatima are known as sharifs, sayyeds, or sayyids. These are honorific titles in Arabic, sharif meaning 'noble' and sayyed/sayyid meaning 'lord' or 'sir.' As Muhammad's only descendents, both Sunni and Shi’a respect them, though the Shi'a place much more emphasis and value on the distinction. Many Muslim notables are descendents of Muhammad. The Hashemite royal family of Jordan (and also formerly of Iraq), the Alaouite royal family of Morocco, and the Aga Khans of the Ismaili community claim direct descent from the Prophet through Ali and Fatima. There are also many humbler sayyeds whose only distinction may be the title in front of their name, or the right to wear a black turban (a sign of Alid descent in some communities). Ali is greatly respected by most Muslims (the Ibadi - which exists in Oman and developed from the Kharijites might be the only dissenters). The Shi'a in particular venerate him as second only to the Prophet. They celebrate the anniversaries of his martyrdom and birth. The Shi'a version of the confession of faith (shahada) also includes an explicit reference to Ali. Ali is described as a bold, noble and generous man, "the last and worthiest of the first generation Muslims, who imbibed his religious enthusiasm from companionship with the Prophet himself, and who followed to the last the simplicity of his example." He was reputed for his knowledge and is said to have elevated the dignity of knowledge through his teaching and writing, not only religious knowledge but also other forms of knowledge as well including the study of grammar. He believed that Islam and the human intellect were in harmony with each other. He believed in developing strong character and in the primacy of justice and truth. He established a free school for boys in Kufa, and was especially concerned with the distribution of the poor-tax. He shared his cousin's profound concern for the welfare of the marginalized and oppressed, the mustad'afun. Sir William Muir praised Ali's 'forbearance and magnanimity' and his wisdom in counsel but comments that this was 'for other than himself', suggesting that he was a better adviser than leader. Muir says that Ali 'never asserted the leading position', was forgiving of his enemies, always attempting conciliation. Just as Muslims do not picture God, or Allah, but reference him by his 99 Names or titles, so Muslims honor Muhammad, Ali, and other pious Muslims with titles of praise and add pious interjections after their names. Many Muslims add the phrase “May Allah be pleased with him” after mentioning the name of a prominent or pious companion of Muhammad. Ali is given an additional pious modifier. When Ali's name is mentioned, along with “May Allah be pleased with him,” Shi'a add “Allah has honored his face,” a reference to the Shi'a belief that Ali converted to Islam at such a young age that he never joined in any worship of the traditional Meccan gods, whom the Muslims believe to be idols. His face, they say, was never defiled by prostrations before idols. Etymological note: Shi'a, in Arabic, means "party of," or "partisans of." Shi'a is actually an abbreviation of Shi'at Ali, meaning "the partisans of Ali [and his descendants]." ↑ Shahid Ashraf, Encyclopedia of Holy Prophet and Companions (Anmol Publications PVT, 2005, ISBN 978-8126119400). ↑ Ali ibn Abi Talib, Nahjul Balagha: Peak of Eloquence (Tahrike Tarsile Qur'an, 1996, ISBN 978-0940368422), 95. ↑ Martin Lings, Muhammad: His Life Based on the Earliest Sources (Inner Traditions, 2006, ISBN 978-1594771538), 344. ↑ 6.0 6.1 Ali, 1996, 7. ↑ Sir William Muir, The Caliphate: Its Rise, Decline and Fall: From Original Sources revised by T. H. Weir (Nabu Press, 2011, ISBN 978-1175046093). ↑ Rafiq Zakaria, The Struggle within Islam: The Conflict Between Religion and Politics (Harmondsworth: Penguin, 1988, ISBN 0140107940), 62. ↑ 10.0 10.1 Clinton Bennett, In Search of Muhammad (NY and London, Cassell, 1998, ISBN 0304337005), 160. ↑ Thomas Carlyle, On Heroes, Hero-Worship, and The Heroic in History (Echo Library, 2007, ISBN 978-1406843842). ↑ Philip K. Hitti, History of the Arabs (London: Macmillan, 2002, ISBN 0333631412), 183. ↑ United Nations Development Program, Arab human development report, (2002) Retrieved October 29, 2013. History of "Ali ibn Abi Talib"
This page was last modified on 5 March 2019, at 23:11.